UNIVERSAL THE STUDIO THAT MONSTERS BUILT! Genre historian David J. Skal helps us celebrate 100 years of Universal Studios and the classic creatures it spawned. Plus! Carla Laemmle takes us back to when she lived on the Universal lot, the children of Boris Karloff and Bela Lugosi reflect on their fathers’ legacies, Creature From the Black Lagoon star Julie Adams and writer Tom Weaver on Universal’s last great monster franchise, the lore of Germany’s Castle Frankenstein, the five greatest sequels, and more! If the Mayans are right, 2012 is the year we’re all gonna die – the only question is, how? For years, filmmakers have speculated on all the ways our species could end, and we decided to catalogue ’em for your Armageddon convenience. Upon release, fans of the franchise hated it for its lack of Michael Myers, 30 years later Halloween III stands on its own. Plus! We weigh the treats versus the tricks of the new Blu-ray reissues of Halloween II through 5. 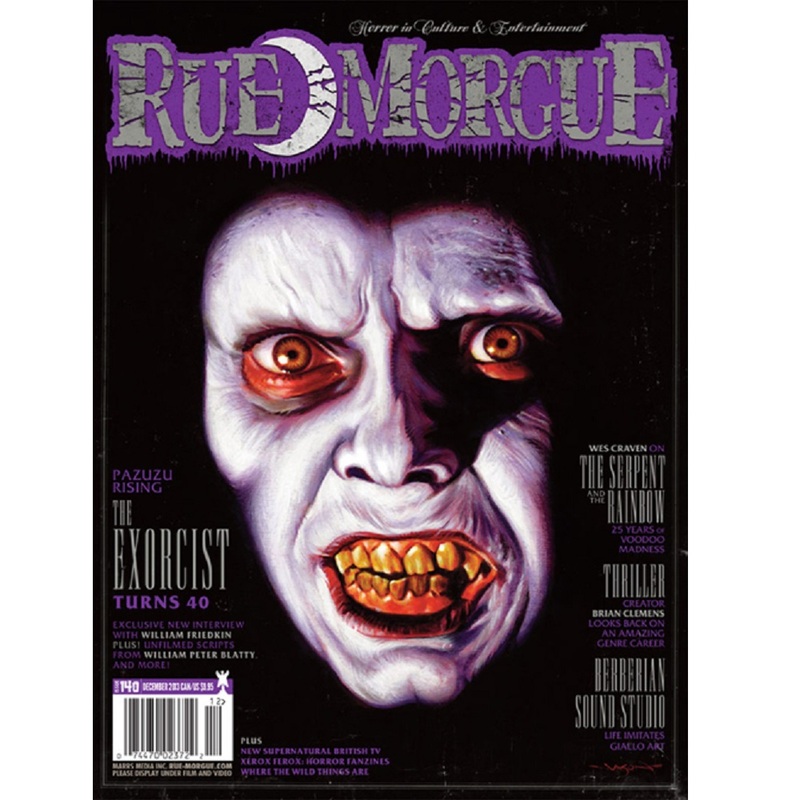 Metallica guitarist Kirk Hammett gives genre fans a peek at his collection of rare horror memorabilia with a new book called Too Much Horror Business. 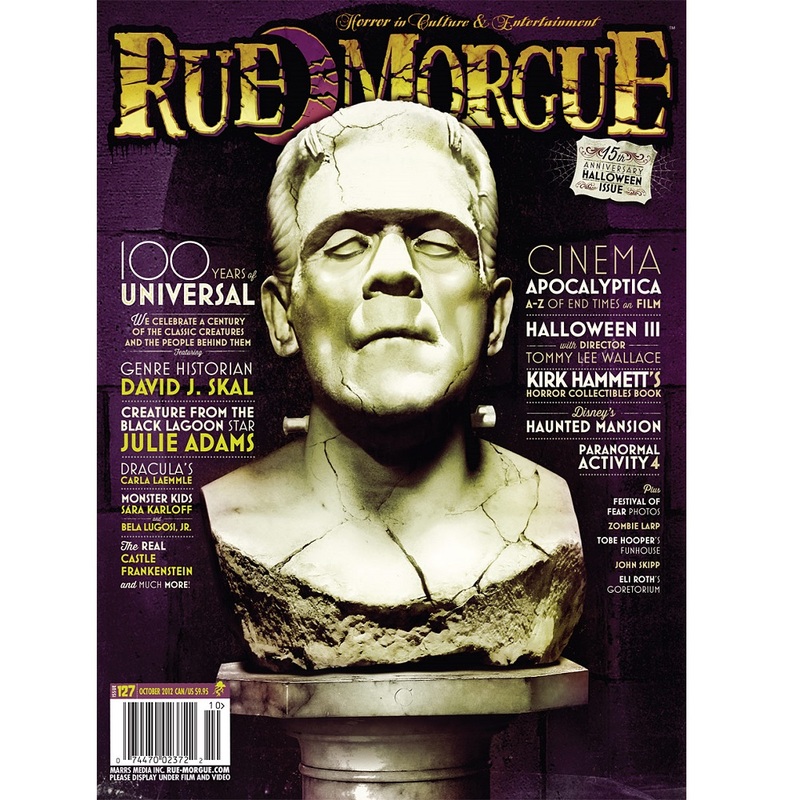 Rue Morgue’s 9th annual horror convention in pictures. Just in time for Halloween, we recount the history of Disney’s world famous Haunted Mansion. When it comes to scaring the hell out of an audience, the makers of Paranormal Activity 4 know that the secret lies in the normal. Eli Roth’s Goretorium open in Las Vegas; Urban zombie game inspired by Danny Boyle’s 28 Days Later; Racially charged story ignites controversy at Weird Tales. Weird stats and morbid facts. Sick Top Six: Apocalyptic Atrocities. Universal Classic Monsters: The Essential Collection Blu-ray; Bela Lugosi Dracula Model Kit; Ring of Dracula Prop Replica; and Mummy Minimates Box Set. CineMacabre features Jennifer Lynch’s Chained, and animated monster movies ParaNorman and Hotel Transylvania. Plus reviews of Solomon Kane, The Possession, Father’s Day, Grimm: Season One, Bait, Screaming in High Heels, Crepuscule, PWCA, Her Heart Still Beats, The Revenant, Starship Troopers: Invasion, Deadtime, Dreams of the Dead, Where the Dead Go To Die, and My Sucky Teen Romance. 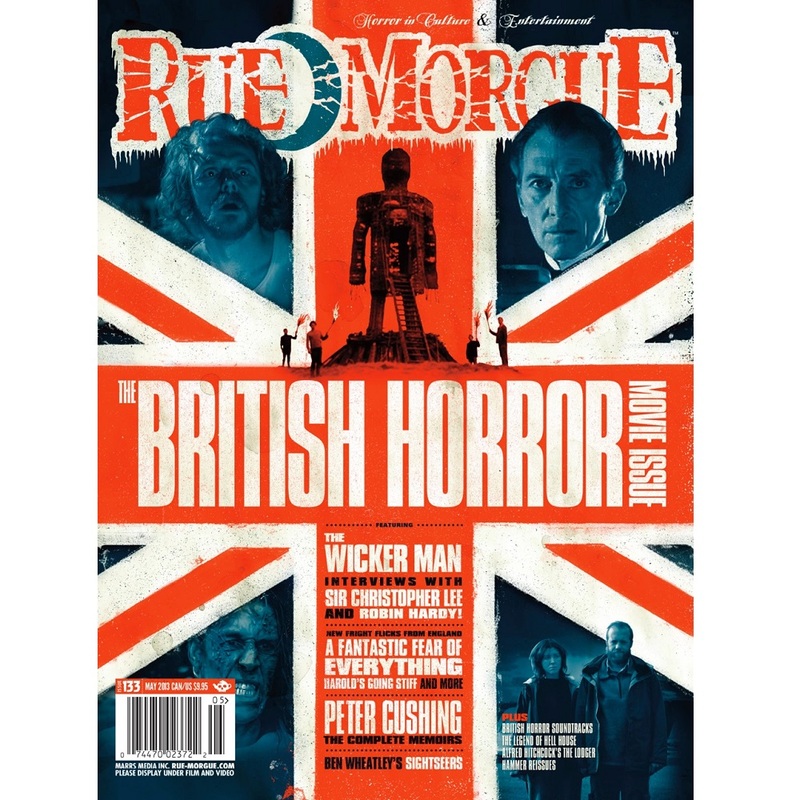 Reissues features the five best episodes of the British TV series Hammer House of Horror, plus reviews Rosemary’s Baby (1968), Re-Animator (1985), Death Watch (1980), Twins of Evil (1971) and Tales That Witness Madness (1973). 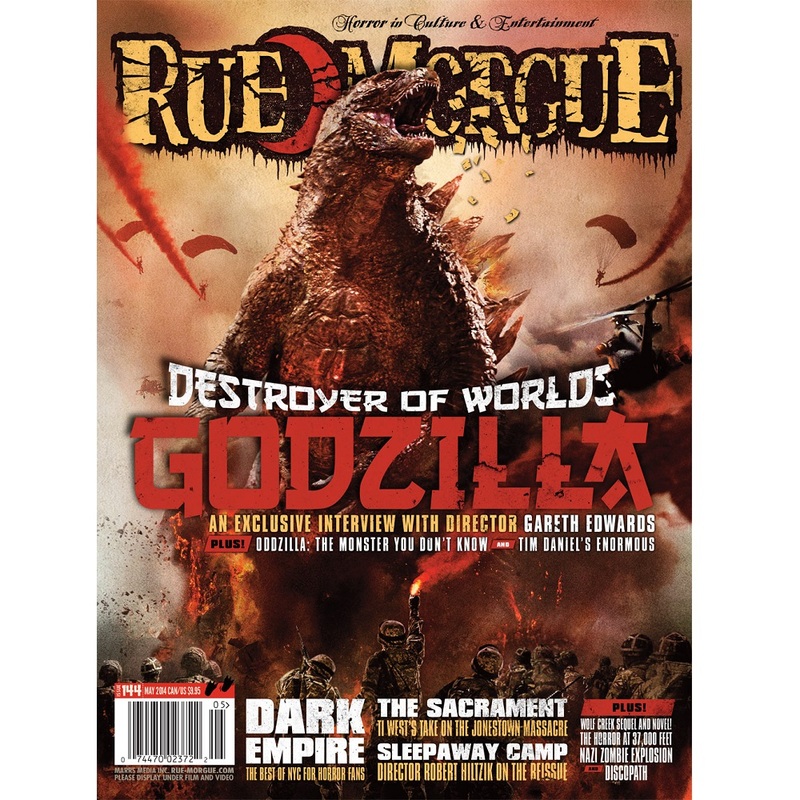 Features Colder, plus reviews of The Creep #0 of 5, Godzilla: The Hald Century War #1 of 5, Beasts of Burden: Neighborhood Watch, Dark Shadows/Vampirella #1, and Debris #1. Spotlight: John Skipp’s Psychos anthology. Library of the Damned rounds up five books for the bunker. Plus, reviews of Becoming Ray Bradbury, European Nightmares: Horror Cinema In Europe Since 1945, Character Actors in Horror and Science Fiction Films, 1930-1960, The Mammoth Book of Body Horror, Hugh Sterbakov’s City Under the Moon, Corrine de Winter’s Valentines for the Dead, David Annadale’s Gethsemane Hall, Mariah de la Croix’s Restless in Peace, and The Vampire Combat Manual. Raiding the ’80s with Slasher Design. Menu: Death Metal’s Goriest Platters. Featuring a round-up of monster records. The Devil’s Playlist compiles one last listening party for the end of the world. Plus, reviews of Brutal OST, I Married a Monster from Outer Space/The Atomic City OST, Lady In A Cage OST, When a Stranger Calls OST, Zonen, The Birthday Massacre, The Panic Beats, Jess and the Ancient Ones, Chrysalide, Dethklok, Dopethrone, Auroch, Nile, Dublin Death Patrol, and Autopsy’s brand-new DVD. We play Dystopia Rising: A Zombie Larp, plus reviews of Skyrim: Dawnguard DLC and Eerie Estate Agent. 15 new subscribers will win a copy of The Walking Dead – The Complete 2nd Season on Blu-ray courtesy of Anchor Bay Entertainment.